A builder from Stoke-on-Trent has won a new Ford Ranger pick-up truck worth £29,599 in Toolstation's Winter Bonanza prize draw. 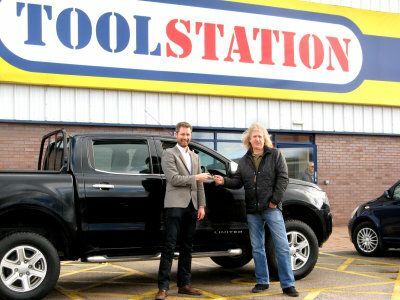 Tim Bedson, a general builder and joiner, scooped the top prize in the annual draw and received the keys to his new truck at the Stoke-on-Trent Toolstation branch. The Winter Bonanza draw received over 150,000 entries and awarded over 150 prizes in total. Other winners got their hands on some of Toolstation's most popular products, including a Milwaukee six-pack power tool kit, Draper kits, Makita drills and torches by Nightsearcher and LED Lenser. Commenting on his win, Mr Bedson said: "I still can't believe I've won! Nobody ever expects to win when they enter competitions so it came as quite a shock. A brand new pick-up truck is an incredible prize, especially for those of us who work in the trade. Now that I've got the keys, I can't wait to take it out for a spin!" Toolstation director of marketing John Meaden - who handed over the keys to Mr Bedson - added: "Our annual Winter Bonanza is our chance to say thanks to Toolstation customers, and this year I was pleased to be able to hand over the top prize to Tim - a very deserving winner with many years' experience in the construction trade. "The prize draw was a huge success and it's brilliant to be able to reward so many tradespeople and home improvers in this way." yet again fast and efficient service, You guys always have the parts we need and a friendly face, even my wife enjoys going to your store, who said women dont like DIY.